Barça kicked off their campaign as defending Copa del Rey champions with a difficult away trip to Galician country to face Celta de Vigo in the first leg of their Round of 16 clash. With Lionel Messi and Luis Suarez still on vacation and Paco still out injured, Barça B striker Arnáiz stepped up to the occasion and scored in his third consecutive cup appearance in the 15th minute. He was in front of the goal when he finished off a low cross from Andre Gomes to give Barça the away goal. Unfortunately, Barça’s lead would only for 16 minutes before Pione Sisto’s thunderous finish gave Celta the equalizer in front of their fans. Neither side would score a game winner but one of the positives for Barça was watching the return of Ousmane Dembélé after being out of action since suffering a hamstring injury back in September in just his third appearance for the club. Barça fans will get to see Dembélé at the Camp Nou this Sunday when they host Levante before hosting Celta de Vigo for the second leg on Thursday. Celta de Vigo: Sergio Álvarez, Hugo Mallo (c), Sergi Gómez, Fontás, Jonny (Roncaglia, 82′), Lobotka, Jozabed, Wass (Brais, 67′), Pione Sisto (Emre, 67′), Iago Aspas & Maxi Gómez. FC Barcelona: Cillessen, Semedo, Piqué, Vermaelen, Digne, Busquets (c), Denis Suárez, André Gomes, Paulinho (Rakitic, 71′), Aleix Vidal (Sergi Roberto, 76′) & Arnáiz (Dembélé, 71′). Goals: 0-1, Arnaiz (min. 15); 1-1, Pione Sisto (min 31). Previous PostBarça victorious against Real Madrid at the Bernabéu. 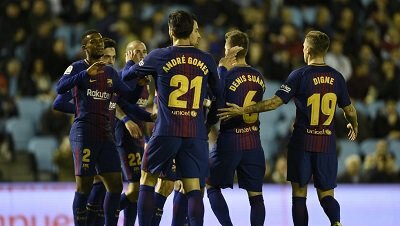 Next PostBarça defeat Levante 3-0 to kick off the New Year.